In an effort to start cleaning off my desk, I’m selecting albums at random from my “to be listened to and put away” pile to write about, and then… well, most likely to then fail to find anywhere to put the album because all of my shelves are full and I haven’t gotten around to buying new shelves. Ahem, anyhow, I digress. 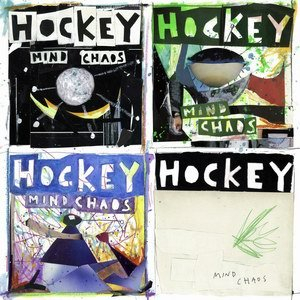 The first album in my absolutely random untimely review series is Hockey’s Mind Chaos. I was introduced to Hockey at Lollapalooza last year, by virtue of them being the first band to take the stage on the side of the festival that I would essentially be spending the whole day at. Despite their set being plagued by bad weather, sound problems, and eventually, power outages, these guys put on a solid show. It’s tough to get anyone’s attention when most of the festival-goers are still waiting in line, but Hockey definitely managed to get it done. I can only imagine what they would be able to do in a better environment. Hockey isn’t really the type of band that would get much attention from me. But I am easily wowed by a great live show, so I was excited to check out their album when it finally was released here. The album is full of great songs which stand on their own: singles, if you will, if anyone still thinks of music in that way. “Too Fake”, which leads off the album, is one of those songs; in fact, I’m pretty sure that it shows up at random in a commercial. Call it selling out, call it a great way to get your music out there to the public, whatever, I just like hearing the song on TV, even if it does get stuck in my head after I hear it. Mind Chaos, for the most part, maintains a pretty steady pop feel, with just a few songs that veer off in one direction or another. With “Work” and “Song Away”, as well as “Too Fake”, the first half of the album is entertaining and mostly upbeat. The second half gets a little more disjointed, with a few songs that don’t feel like they belong on the album. While everything else has a synth-pop feel, “Curse This City” feels like a more traditional rock song. And if you take away the chirpy synth beats in “Four Holy Photos”, you’ve got a fantastic alt-country song hiding in there. They make the album sound a little less cohesive, but also show that the band has more to offer than dance hall beats. Overall, this is a really strong debut album from a young band. Singer Ben Grubin’s voice is just unique and unusual enough to grab my attention without being irritating. I’m interested to see what they come up with next, because they have an enormous amount of potential. 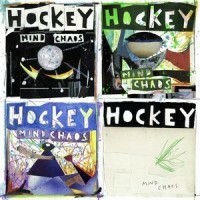 Hockey plays at Schubas on March 12. The show starts at 10:30 and tickets are on sale now for $12. Behind the jump, check out a video of their performance of “Song Away” at Lollapalooza — complete with the uncalled for power outage.